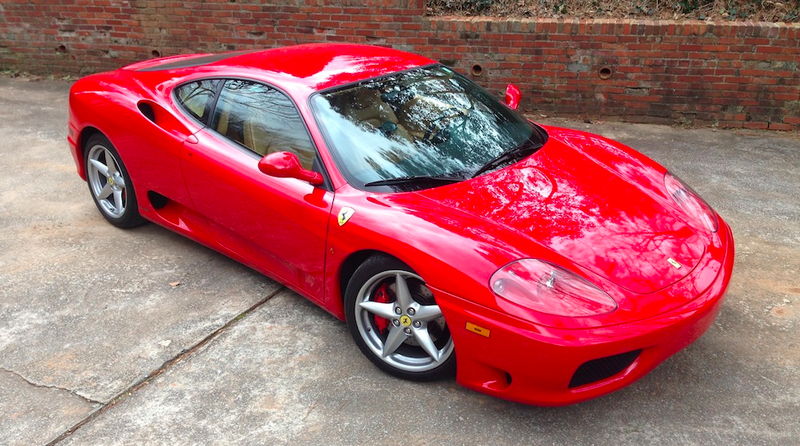 As I look back on the ownership of my Ferrari 360 Modena about a year after I sold it, I think I can finally say that I’ve pinpointed the major reasons why I didn’t like it. I covered a few of these reasons in depth when I owned the car. There was, for example, the fact that I couldn’t park it anywhere without the fear of damage, or vandalism, or unwanted attention. And there was the fact that I couldn’t drive it anywhere without the fear of mechanical issues, or potholes, or value-diminishing accidents. And then there were the gas station encounters. Oh, the gas station encounters. Where some unkempt, overweight chain smoker would walk up to me, cigarette in hand, and call out, “WANNA TRADE?”, as he pointed to his beat-up work truck, laughing to himself like he had just delivered an especially hilarious version of The Aristocrats. The first time, it was funny. By the seventy-eighth time, I was wondering if I could murder him and convince a jury to let me off. But as I’ve had more time to reflect on things, I think I’ve come up with another major reason why I didn’t really enjoy owning my Ferrari: I never really trusted it. Now, this could’ve been because it was an aging Italian sports car with an engine that costs more than a bionic limb. Or it could’ve been because of the very first day I took it home, when it spewed more smoke than London during the Blitz. I’ve never told this story before. In fact, I’ve done everything I could to block this story out of my memory, largely because in the giant history of “traumatic things that have happened to me,” it ranks as number two. Number one is the time I decided to leave the nurturing comfort of my mother’s womb for the cold, harsh reality of the human existence. But I have decided to share this story here for you, the reader, with one important condition: that you never, under any circumstances, in any situation, as long as you live, tell it to the guy who bought my Ferrari. As I recall, I purchased the Ferrari on some Saturday morning in January 2014. What happened was, my friend Andrew and I flew from Atlanta to Fort Lauderdale, Florida, at 6 a.m. on some low-budget airline, with a stupid name like SOUL, or JetEssence, or maybe something with an exclamation point in it. Here’s a tip: if your airline’s name has an exclamation point in it, you’re never going to see your bags again. I knew it would be bad from the moment we took off, when the woman next to me pressed the flight attendant call button before the wheels even went up. Moments later, the flight attendants rushed over, battling the forces of gravity as the plane sharply climbed, expecting some life-or-death emergency. It turned out the woman had never been on a plane before, and she thought that was how you ordered a drink. Needless to say, we were the only people on that flight who were going to Florida to buy a Ferrari. We bought the car around 11 a.m., and then we immediately started the five-hundred-mile drive back to Atlanta. Whenever someone hears about this drive, they always ask me the same question: “HOW FAST DID YOU GO, MAN?!?? !” And I always respond with the same answer: about four miles per hour below the speed limit. This is because speeding through rural north Florida and rural south Georgia in a Ferrari would be like walking into the police station to report that someone has stolen your cocaine. You’ll be arrested, and you’ll probably have to spend the night in jail with a guy who got arrested for DUI on a riding lawnmower. So we made it to Atlanta around 9 p.m., and I decided to park the car at my friend Mike’s house for the evening. This is because I didn’t have a garage—and while I was planning to normally keep the Ferrari in a warehouse about thirty minutes away from my house, I decided on this first occasion to leave it close to home. That way, we could wake up early Sunday morning and film the very first video, where I would express my SHEER JUBILATION about OWNING A FERRARI!!!!! But that jubilation never came. As I recall, it was replaced by fear, terror, anxiety, dread, horror, and various other words that come up when you put “fear” into thesaurus.com. Such as consternation. Here’s what happened: the very next morning after the five-hundred-mile drive, I went to Mike’s house to retrieve the car so I could shoot the video. So we opened his garage, and we oohed and we aahed over every inch of the car. And then I got inside the car so I could pull it into his driveway, where we would ooh and aah some more. This is when the consternation began. As I recall, I started the car and smoke immediately began billowing out of the exhaust. And I don’t mean there was some steam coming out of the exhaust, or a few vapors like you get when you start your car on a cold morning. I mean there was smoke, serious smoke, as if the car had just chosen a new Pope, and its name was 0W-40. Immediately, I shut off the car and I began to freak out. Why is my new car SMOKING? What the hell is WRONG with it? What’s the PROBLEM? What is GOING ON? If I had to put my feelings into words, I would say that I was, at this point, seriously consternated. With far more experience working on cars than I have, Mike quickly floated the idea that the white smoke might mean the car had a blown head gasket. It was a good theory, since white smoke is a common sign of a blown head gasket: when the head gasket fails, coolant leaks into the combustion chamber, and smoke is produced as the coolant burns off. Here’s why: In a normal car, a head gasket repair is incredibly expensive. It usually costs thousands of dollars, and that’s assuming the engine is still in acceptable condition to be repaired. If not, it costs even more thousands of dollars to find and install a new engine. A head gasket repair is so expensive that it often costs more to fix than the actual value of many older cars, or many newer Mitsubishis. But in a Ferrari? In a Ferrari, I had no idea what it could cost. Thousands, for sure. Maybe tens of thousands. A new engine would be $40,000, plus much more for installation. Could it be that expensive? Possibly. I didn’t know. The only thing I knew was that the mechanic would have a great time telling this story as he sailed around the world on his ninety-foot yacht, the S.S. Engine Out Service. can i cancel a cashier’s check? Unfortunately, this wasn’t yielding any major help. It seemed there were very few Ferrari owners who had experienced a head gasket failure in the 360—and the few who reported it had something like eighty thousand miles on their cars, or they had ignored obvious warning signs like major overheating. With so few other reported failures, was I in the clear? Was the smoke just a strange coincidence? To put my mind at ease, Mike suggested that we take a look in the coolant tank. His theory was that if the coolant tank was empty, the car might be leaking coolant—potentially a sign of a blown head gasket. But if it was full—the more likely scenario—then there was no head gasket leak, the smoke was from something else, something smaller, and I could relax. Then we could re-start the car, finish the video, and everything would be fine. The consternation would be gone, the sheer jubilation returned. I agreed that this was the best course of action, so we opened the coolant tank. It’s hard to explain how anxious I really was at this point. No coolant and lots of smoke generally means that you’re looking at a head gasket replacement, and this cost would’ve been truly, ridiculously, absurdly, insanely, start-a-GoFundMe astronomical. I was Googling everything I possibly could find that was even remotely related to my problem. I was reading about coolant, and smoke, and head gaskets, and Ferraris. I even Googled the previous owner, to find out if he had been featured in any of those CNBC shows about financial fraud where some guy in Florida with a Hawaiian shirt and a Hummer H2 convinces a bunch of old people that the secret to major wealth lies in the Guatemalan cucumber trade. I clicked on every single Yahoo Answers link about head gaskets, and smoke, and engines, including one from a guy with an ’89 Buick LeSabre asking if he needed a new engine because a family of warblers had been living in his number four cylinder for the past year and a half. At this point I was so terrified that I called up a friend of mine who has a lot of experience with exotic cars, and I explained the situation. Actually, “explained” isn’t really the right term. A better way to describe it would be: I shouted into the phone in sheer panic. I think if you look back into the long global history of panicked telephone calls, you would have, ranked by overall level of panic, a) Madeleine McCann’s mom calling the Portugese police, b) this phone call to my friend about my Ferrari, and c) Steve Bartman telling his wife to start packing the car, because they were leaving Chicago for a little while. Although my friend gave me some reassuring words (“they all smoke,” and “don’t worry about it”), he wasn’t able to calm me down. So then Mike called one of his friends—a person with a lot of Ferrari experience, in the sense that his father owned a 360 Challenge Stradale and an F40 — and he told me the same thing: they all smoke. Don’t worry about it. It’s no big deal. WELL THEN WHY THE HELL IS THERE NO COOLANT? WHY DIDN’T IT SMOKE YESTERDAY ON A FIVE-HUNDRED-MILE DRIVE, BUT TODAY IT’S SMOKING LIKE SNOOP DOGG? WHAT THE HELL IS GOING ON HERE???? At this point, it had been about an hour of sheer terror and panic since I first started the car earlier in the morning. With few other ideas (aside from “wait until Monday and flatbed it to a dealer”), Mike and I decided to drive our consternated selves to the auto parts store in a different vehicle in order to pick up coolant, which we would then pour into the coolant tank. If the car started up with no smoke, everything was probably fine. If the coolant leaked out of the car, we would know there was a serious issue. So we arrived at Napa Auto Parts, and we walked up to the coolant aisle, and the following realization dawned on us: what the hell type of Napa Auto Parts coolant do you put in a Ferrari 360 Modena? In fact, what the hell type of Napa Auto Parts coolant do you put in anything nicer than a 1984 Dodge Aries? Just as we were having the conversation, a helpful Napa Auto Parts employee walked up to us and asked for our year, make, and model so she could look up the coolant type. “It’s a 2004 Ferrari,” Mark replied. The woman just chuckled and walked away.